PALU (Indonesia): Susi Rahmatia thought her five-year-old son Jumadil was dead, but yesterday – a week after they were separated by Indonesia’s earthquake and tsunami – they enjoyed a miraculous and emotional reunion. Rahmatia, 26, leaped out from under the tarp she now calls home and raced across the litter-covered grass when she saw her lost boy. Scooping him up, she smothered him in kisses, while instinctively working her fingers around his small body to feel for injuries. Luckily, she found none. When the sobbing subsided, there was little that overwhelmed Rahmatia could say, telling AFP journalists who witnessed the scene again and again “I thought I lost him”. A week ago, Jumadil had been playing in the same black and red top he still wears today in a beach-side park a short distance from his grandmother Ajarni when the first quake struck the now devastated seaside city of Palu. In the chaos – and unknown to her, with a tsunami fast approaching – Ajarni, 48, who like many Indonesians has only one name, tried frantically to find the boy. When the monstrous wave came into view and was about to pound the shore, she could look no more and ran – tumbling over a parked motorbike – in a desperate life-or-death scramble. The wave was too fast for her, and she was caught up in the rushing waters. She survived, unlike hundreds of others, and only required ten stitches. But Jumadil was gone. Over the next week, the family struggled to survive day to day and never fully gave up the hunt for their boy. “I thought this child was already dead – we were looking for the body but we couldn’t find it,” said Jumadil’s 24-year-old father Muhamed Arif. “His mother felt he was still alive.” Jumadil’s uncle posted a notice on a Facebook page for survivors in the city, hoping the picture of his nephew may jog someone’s memory. They did not know that Jumadil had been taken to the station by concerned police officers immediately after the quake – they believe he dodged the tsunami by a matter of minutes. At the station, the disconsolate boy just repeated cries of “mummy” and “daddy” until he was befriended by Sartini, the wife of a local imam, who was also seeking refuge there. 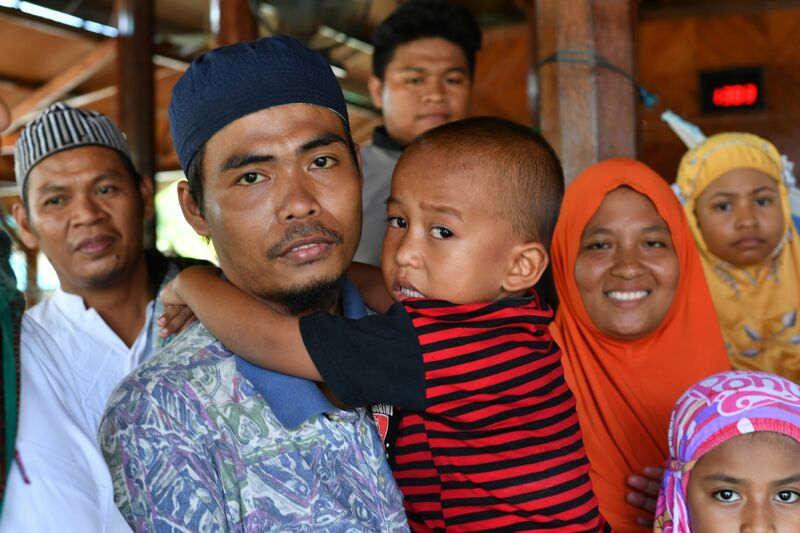 Indonesian parents reunited with son after a week of tsunami anguish 0 out of 5 based on 0 ratings. 0 user reviews.